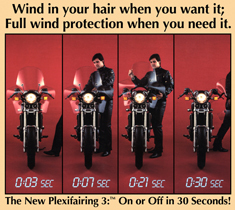 We introduced the Plexifairing™ in 1984, and it was an instant hit with riders worldwide. This best-selling windshield has truly gone "platinum". It was soon followed by our Plexistar™, similar to the Plexifairing but with a sportier, smaller profile. 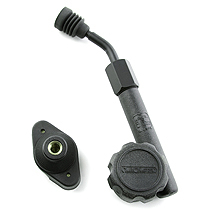 The included, patented QuickSet™ Mounting Hardware ensures easy, 10-second installation and removal, leaving minimal hardware on the bike when the shield is off. 1 Requires BAG#51 for 7/8" handlebars. 2 BAG#47A and BAG#53 needed for non-tubular handlebars. 4 Slight trimming needed for radiator clearance. 5 Requires BAG#076: Supplementary Hose Clamps for Large Diameter Forks. 6 Trimming will be required to allow clearance for turn signals. 7 BAG#53 and BAG#54 needed for mirror mount. 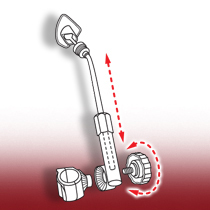 The Plexistar™ is similar but the lower extensions are abbreviated for a sportier appearance. Both have No-Hole Ballsocket™ mounts and include our QuickSet™ Mounting Hardware for riders who enjoy the advantages of excellent wind protection but occasionally like to leave the fairing at home. Minimal hardware remains on the bike when the fairing is removed. Illustration at left depicts relative, comparative profiles of the Plexifairing, Plexifairing GT and Plexistar. 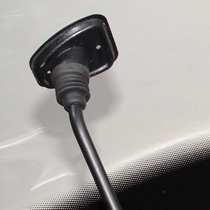 This same mounting system is used on the Plexifairing's smaller sibling, the Plexistar™. Both the Plexifairing™ and Plexistar™ are constructed from 4.5mm thick, DOT approved High Impact Acrylic. Both incorporate our patented No-Hole Ballsocket™ technology and QuickSet™ Hardware System.